Finally, a game about toy soldiers has real toy soldiers. Star Bright skips around the battlefield, Dark Lord throws a d10 at sci-fi soldiers, and the Kaiser’s army holds off G.I. Joe, Cobra, and He-Man. How does a Toy Soldiers fan not love this? The Toy Soldiers tower defense franchise takes place inside dioramas that are a cross between model train sets and tabletop wargaming terrain. You build weapon emplacements and kill enemies trying to get into your base. Those enemy toys that do get through drain your health meter, and if the meter reaches zero, you lose. The original Toy Soldiers was set in a World War I theme, with Germans and British Doughboys duking it out over the trenches. Toy Soldiers: Cold War was wrapped in Reagan-era anti-Soviet themes reminiscent of Rambo and Red Dawn. With War Chest, series developer Signal Studios has decided to dispense with any theme other than what the franchise has always been about, i.e. playing with toys. The four default armies are each defined by a hero character. 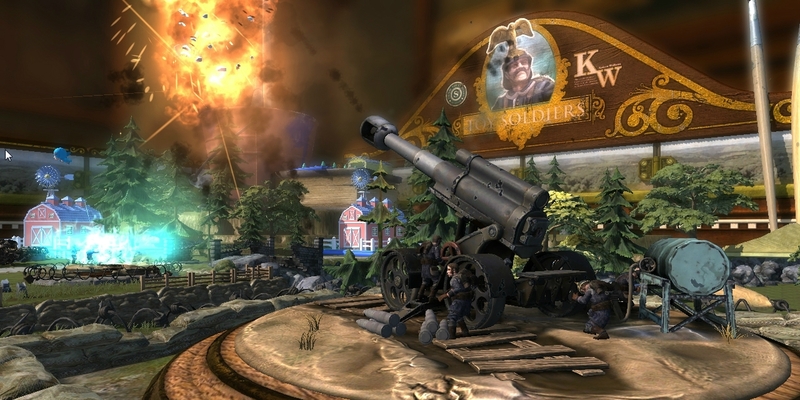 The Kaiser and his World-War-I-meets steampunk type technology is a throwback to the original game. Phantom leads an army of generic sci-fi toys. Dark Lord is in charge of a fantasy army that includes cute references to tabletop role playing games. Flying eagle units drop d20 bombs on targets, and the Dark Lord himself throws d4 and d10 dice at the enemy. Star Bright’s army is a combination of Care Bear, My Little Pony, and Rainbow Brite-esque units and is absolutely the best of the default four armies. Fairies, dancing bears, prancing wind-up ponies, and giant, rolling cats marching through the lanes are impossible to take seriously even as you’re slaughtering them by the hundreds to keep them away from your base. Playing as Star Bright herself is so preposterous that it was one of my favorite moments in the game, watching her skip around the battlefield shouting family-friendly dialogue about love and friendship while shooting enemies with a rubber ducky gun and throwing grenades that exploded into pink clouds of friendship hearts. In addition to the humanoid heroes there are also giant tanks and aircraft that you unlock for play during a level, by killing enough enemies to fill a hero meter on the left side of the screen. The more energy you accrue, the bigger and better the hero unit you unlock. I was never able to use my hero units as much as I’d have liked to, because the hero energy meter drops if you’re not constantly killing enemies. No matter how quickly I took out the enemy forces, I still found it difficult to unlock my heroes for use on the battlefield. Multiplayer mode can support up to four players in 2v2 matches, and gives you a chance to go on offensive. All the units that attack you during the single player campaign are available for you to deploy against human defenders in the multiplayer mode. The teams swap back and forth between attacker and defender, with the attacker beginning each round with a hero unit. Whoever’s toy box has the most health at the end of the match is the winner. Survival mode, with its endless waves of enemies, and the Weekly War mode, with five battles spread over the five days, give you a free taste of the four premium armies for Toy Soldiers: War Chest, namely He-Man, G.I. Joe, Cobra, and the Assassin’s Creed armies. Each premium army will cost you $5. Or you can go all-in with the Hall of Fame Edition, that costs double the price of the base game and includes all four premium armies. Whether or not the Hall of Fame edition is worth your time probably has everything to do with your age. Players in their teens or 20s likely have little to no nostalgia for He-Man and G.I Joe. A Gen-X player on the other hand might remember all the G.I. Joe and He-Man toys in War Chest, because Signal Studios chose to add only the coolest toys from the licensed properties into the game. In other words, the toys that Gen-X geeks most likely owned if they collected He-Man and G.I. Joe. I recognized every single figure and vehicle in the Cobra army, which is really the army that made me want to play Toy Soldiers: War Chest in the first place. Younger players will more likely be interested in the Assassin’s Creed army, but in the end the premium armies are just skins. None of the eight armies are substantially different from one another. They can’t afford to be, or else the multiplayer mode would be unbalanced. The basic function of all the weapon emplacements and the available upgrades are all more or less the same, regardless of which army you play as. I occasionally wanted the option to speed up the action, when it became clear that my defenses were going to absorb a wave of enemies just fine, so that I could apply repairs and upgrades and get to the next wave more quickly. Some of the levels felt cheap, like placing enemy turrets within my backfield from the start of the level. Any defenses I built within range of those enemy turrets were blown up, such that I would immediately restart having figured out where I could or could not actually place the all-important, starting defenses. Load times, especially when booting the game up for the first time felt long. The edges of the screen were cut off for me, because if there’s an option to adjust the display to match the size of your television, I can’t find it. I also experienced some chug when there was too much action taking place at once. There are game rules I still don’t understand, like how to Overcharge defenses to give them larger magazines before they need to reload, and to allow them to fire more quickly. The base game alone was worth my time for the laughs Star Bright gave me. The Weekly War and multiplayer modes might hold my attention for longer than Cold War did, and I also enjoyed the nostalgia trip. That makes me wonder what Signal Studios is going to do for the next Toy Soldiers game. A cynic might say that War Chest was a delivery mechanism for some licensed properties and an opportunity for Ubisoft to showcase its most important IP. It’s also the first Toy Soldiers game available for PlayStation. Success among the Sony crowd could determine whether or not there is going to be a Toy Soldiers 4, such that Signal Studios then has to tackle about where the franchise may go from here. Disclosure: Our Xbox One copy of Toy Solders: War Chest was provided by Ubisoft.